Disney Infinity is an arcade game in which the most famous characters and worlds from Disney and Pixar movies appear. Production allows you to create your own levels based on selected elements of fairytale brands. 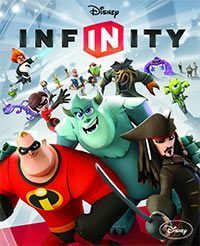 Disney Infinity can be described as a virtual playground where different characters, objects, means of transport and buildings from the most important brands of Disney and Pixar film studios appear together. The game was created by Avalanche Software studio, which previously worked on such productions as Cars 2: The Video Game, or Toy Story 3: The Video Game. Disney Infinity offers a world filled with various attractions and mini-games. The fun takes place primarily on storyline levels, built on the basis of Disney's brands, containing numerous puzzles to solve and enemies to overcome. Of course, a few boards available at the start of the game are not enough - you can have fun at the so-called Playground, where players can design their own levels filled with various attractions and objects, such as race tracks, shooting ranges, mazes, or football pitches. You can decide on the look of the virtual world by combining elements from any film brands appearing in the game. At ready-made levels you can play with friends or yourself, and even share them with a wider community of players (although in order for others to be able to download them, they have to pass the authorization of the manufacturer). To have fun you need a special docking station (Disney Infinity Base) on which you place the figures of the characters you want to control. Depending on the size of our collection, we can direct different characters in Disney's films: from animated Sulley of Monsters and the Company, or Buzz Astral of Toy Story, to Jacek Sparrow or Davy Jones of Pirates of the Caribbean. Each character has individual abilities and gadgets. On the stand there is a place for a plastic block, changing the appearance of the world. Additionally, the character's features can be modified by means of the so-called Power Disks, i.e. RFID cards placed on a stand under the figure. They empower characters with special skills or add new items for use in the game. Disney Infinity gains a lot in multiplayer mode, where players can play together on one screen or connect to each other over the Internet. For the fun of many people, the creators have prepared a lot of attractions, such as interactive cities or a la "capture the flag" mode. Comic, colorful graphics refer to the atmosphere of Disney's animated films. The models of the characters resemble a little bit the toys that many of the American film studio's favourite fairy tales have in their collection.